This site is primarily a resource for members of the MRC, but it's also a showcase for the club so feel free to poke around and explore the site. 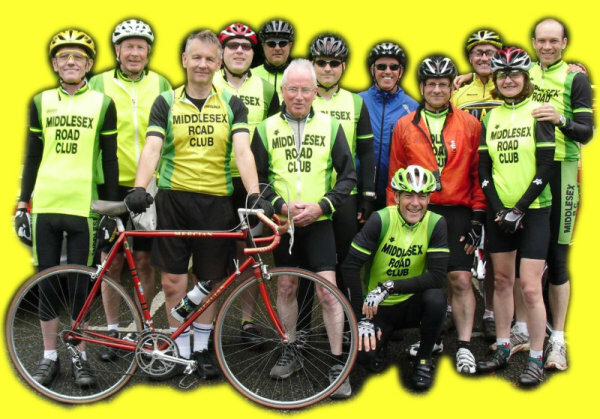 The MRC was founded in 1937 and today has a membership of around 40 - there's loads more stuff about the club on the about page and loads of information about our riders littered about the site. You can look at the statistics for our riders, current Club Records and the full history of our Club Records. Regrettably due to circumstances beyond our control (road works) we have had to cancel the first seven events this year on the H10/2. We hope that normal service will resume on the 3rd of July. 17 Feb. Set up for the 2019 season with the West London Combine on the 3rd of March and Evening 10s on the 15th of May. This site may be hosted on other servers but www.middlesexrc.org.uk will always point at the site. If you experience any problems with our site, please contact our WebMonkey.